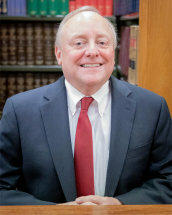 Bernard G. Segatto joined Barber, Segatto, Hoffee, Wilke & Cate in 1985 after graduating from Southern Illinois University School of Law in 1985. Bernard became a partner with the firm in 1990. He was admitted to practice law in the State of Illinois in 1985 and was admitted to practice law in the State of Missouri in 2011. He concentrates his practice in estate planning, real estate, agricultural law, business organization disputes and related matters, bankruptcy rights, creditor’s rights, family law and related civil litigation matters. He is a member of the American Bar Association, Illinois State Bar Association, Sangamon County Bar Association and is a past president of the Sangamon Valley Estate Planning Council. He also frequently lectures on topics related to his areas of practice.